Following the outstanding success of last years retreat with Gail Lawther and the large number of people who were on the waiting list for a space, Gail and I decided to run the same workshops/retreat again this year. Lots of the students have travelled long distances this time and so a good number of them arrived the day before and settled in. Day one was Stained Glass and students could choose either a Mackintosh type Rose or a Venetian Scene. Early on in the day, one lady started having trouble with her machine. What ever we tried it just wouldn't sew & kept breaking needles. 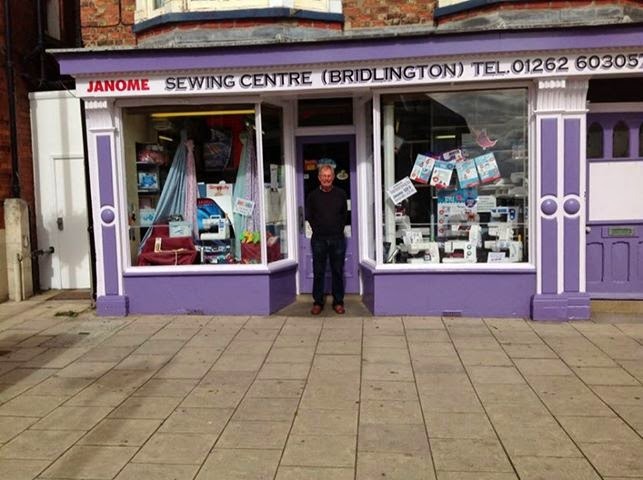 I managed to call John & Barbara at Bridlington Sewing Centre. Barbara said she would come & collect the machine & take it for John to have a look at. She returned the machine within two hours - all fixed! The bobbin case had been damaged, the timing was out. What superb service. Thank you John & Barbara. Make sure you call in when you are in Bridlington. John is a whiz with machines and you can even arrange to have yours serviced whilst you are here at The Royal Bridlington. Day Two was Glimpes of New Zealand. Students could chose Maori Curves or a seascape. Day Three - Monet or Van Gogh. The choice today was Sunflowers or Water/ leaf design. Glenda brought a bag with her which she had made and has used the Seminole which we made in Beryl Franks Workshop to decorate.